Maybe I subconsciously look for this theme in many of the films that come to the Silverdocs Screening Committee, but it does seem that we received a significant number of documentaries this year that deal with carrying on long-established traditions in the face of a rapidly-changing world. If, however, I had to cite one documentary in the current festival line-up that really ran with the topic of maintaining traditions (and the potential price paid in doing so), it would be Aaron Schock’s poignant CIRCO. 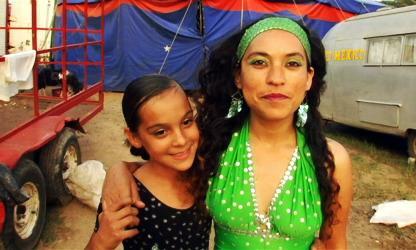 We see the Ponces fulfilling all of the roles in the century-old family-run circus that they drive from town to town throughout rural Mexico: they are at once the proprietors, producers, performers, and roadies. Patriarch Tino struggles to keep the modest circus afloat, aided by his four young children, each of whom pull double duty as both roustabouts and featured acts. In the background is Tino’s dedicated wife Yvonne, who valiantly attempts to hold together both family and business. The challenges faced by all are evident from the beginning of the film. Not only are the drives exhausting and the set-ups arduous, but the little downtime afforded the children is usually spent perfecting their performing skills. We quickly get a sense that these children have sacrificed a normal childhood for the greater good of the business and the medium of the circus. Not only is Tino gradually forced to re-think whether or not all of these hardships are serving his family’s best interest, but he faces the additional pressure of trying to please his aging father, from whom he has inherited this mini-dynasty (at one point late in the film, we find out to what degree the Ponce’s circus actually is a dynasty). Financial pressures, questioning the relevance of the circus as a viable modern-day medium, grappling with the problem of how to provide one’s children with the best possible life; all of these issues eventually place a strain on the Ponce family that threatens to destroy their once-solid bond. Despite the emphasis on the family’s difficulties, there are plenty of delightful scenes that show the performers’ talent, dedication, and enthusiasm for their craft; the Ponces appear to love performing, and their small audiences are genuinely appreciative. And be on the lookout for the inspired (if not eerily prescient) way in which Schock bookends the opening of the film with the final scene. But the uniqueness and exceptional heart of CIRCO is the masterful way in which Schock interweaves the themes of family sacrifice and tension, commitment to tradition and excellence, and the value of passion for the preservation of a potentially-fading art form. ‘My hope,’ writes Schock ‘is that CIRCO tells a universal story while allowing the audience to enter into and learn about a specific family, tradition and country.’ Ladies and gentlemen, step right up and buy your tickets now!